Hello Hello! 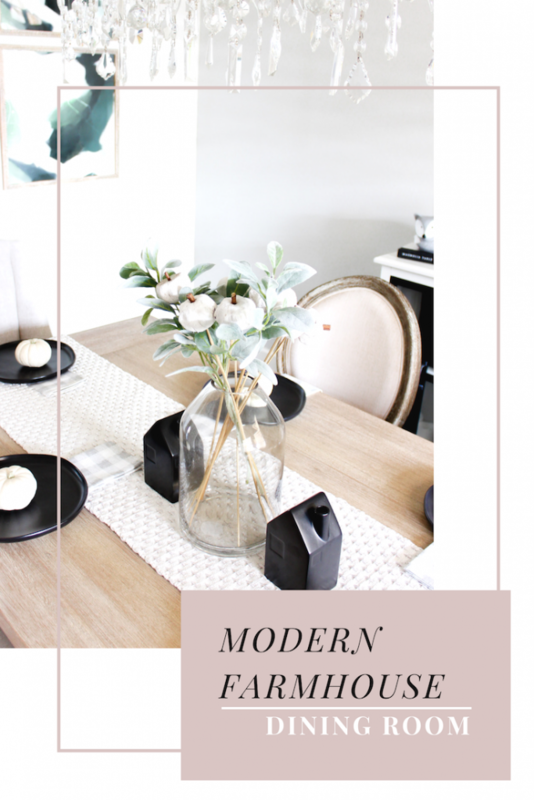 Today i’m giving you a close up look at how I decorated our modern farmhouse dining room. 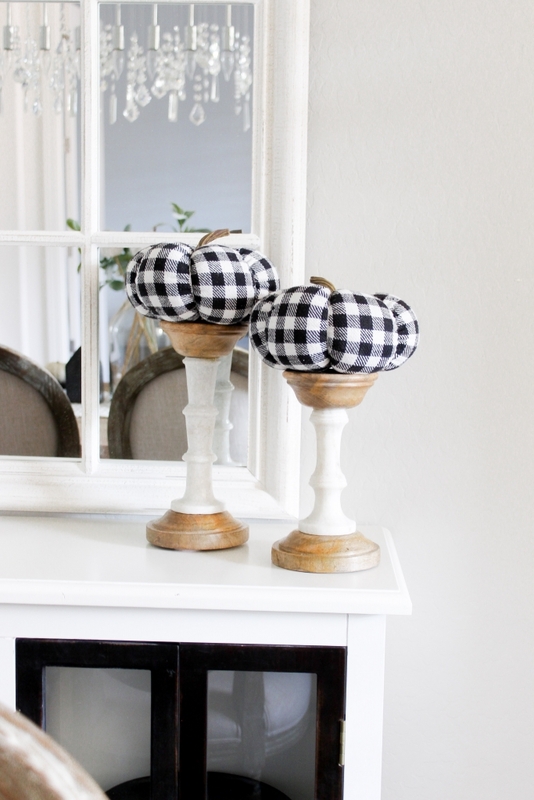 It really only took a few items to give it that modern farmhouse feel so I’m excited to share with you all. 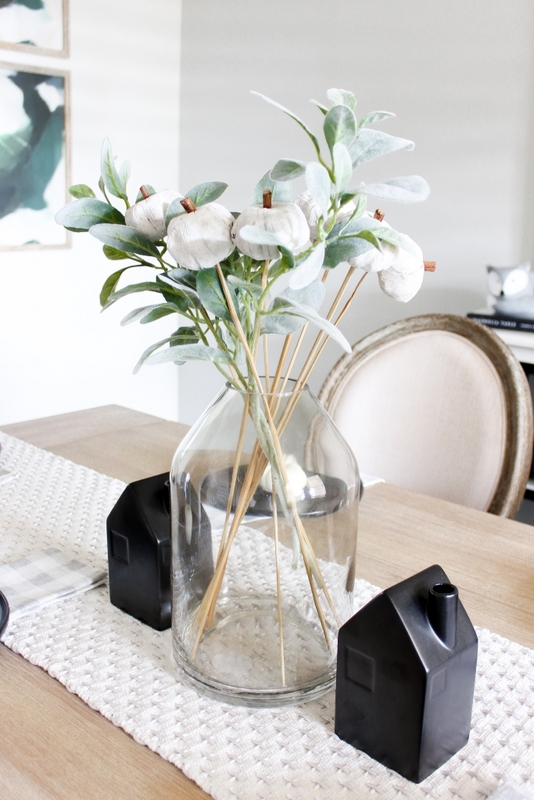 If you want to see how our dining room use to look like last fall you can check out this post. 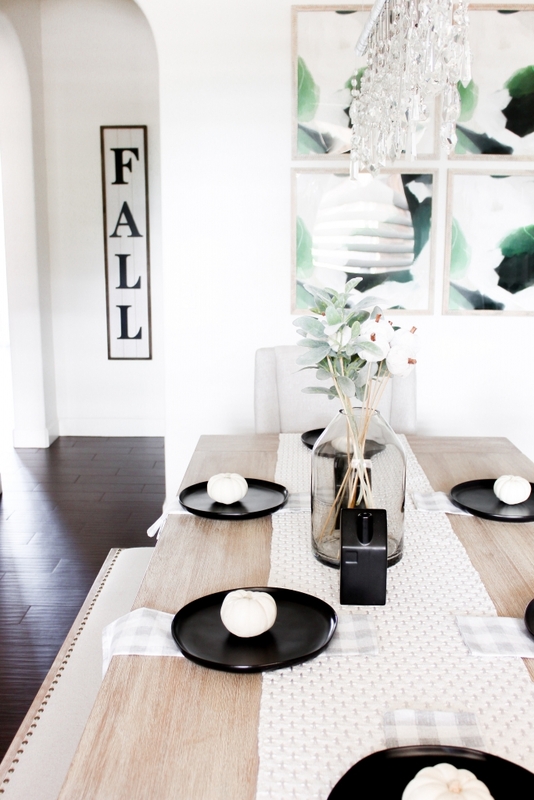 It is a complete different look but both are great ways to style a dining room for fall. Since then we have made some changes to go towards the now modern farmhouse feel. Starting with adding in black accents. I always like suggesting that if you are wanting to change the style of your home to start with accents. This a great way to try a new style before you begin changing larger items like furniture and fixtures. These black plates were actually a great deal! I looked at a few other stores and wasn’t impressed. I ended up ordering them in a couple of packs of 4 but you could also purchase single ones. Next I added two cute houses, vase, plaid pumpkins and since I love everting magnolia this cook book in black as well. For our fall items I went a bit pumpkin crazy but it always happens so I’m not surprised. Is anyone else like this? Anyway I took all the mini white pumpkins I could find from grocery store and placed them on top of the plates. I also found these white pumpkin stems to go with the lambs ear. The day I found these pumpkins I had my entire cart full of even more pumpkin decor but I think I made a good choice in keeping things simple. Alright so I had been looking for a sideboard for some time now and when I came upon this one I knew we had to get it. 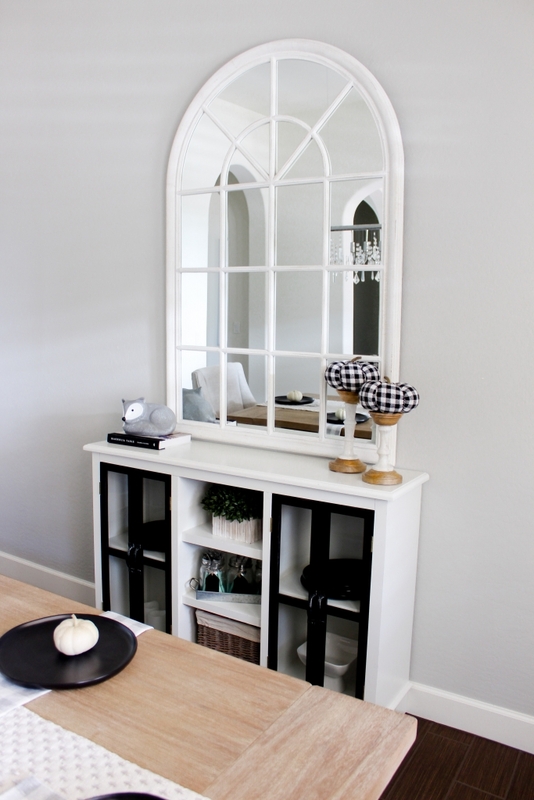 This is farmhouse sideboard is the perfect amount of modern and farmhouse. 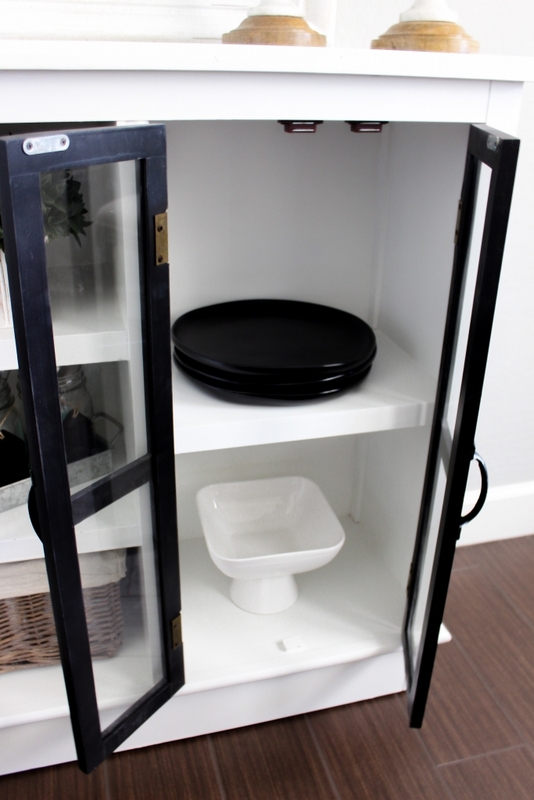 It has 3 open shelves in the middle to place decor or to store silverware. On both sides it has 3 more shelves enclosed with glass modern farmhouse doors. This is a great place to add in serving ware. I went ahead and linked as many things at the top as I possibly could find for you all to make it easier if you want to shop anything. The sideboard is from Kirklands but just incase I’m linking a few other similar ones too. I hope you all loved today’s post. If there is any other holiday decor styling you want to see just let me know down below in the comments! Have a great weekend!